Want to add some architectural interest to your deck or yard? Add a pergola. Often called an arbor or trellis, these canopy-like structures will provide shade to an otherwise fully exposed area, among other advantages. Building one is an easy DIY project that requires an extra set of hands. Ready to raise the roof on your new pergola? 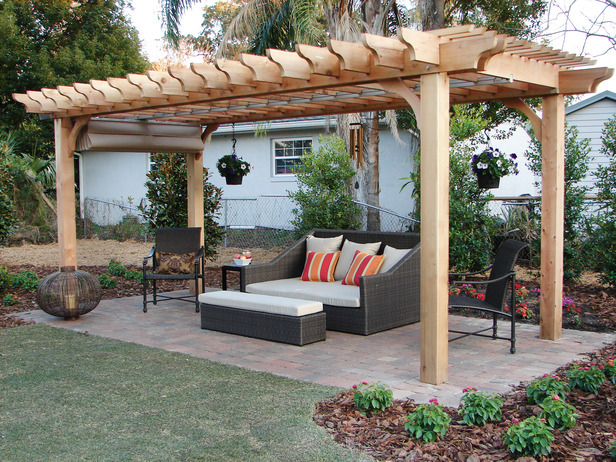 What is the function of your pergola? Is it to provide a quiet secluded oasis for you in the garden or to act as a privacy screen for your outdoor dining area? Will it be free-standing or attached to the house? These are some of the considerations that will affect your design. Style of your home – Whether French country or contemporary, Tuscan villa or mid-century modern, keeping your pergola design in the same style as your home gives you cohesive curb appeal. Ambiance – What kind of experience are you trying to create? Romantic, rustic, relaxing? Play up your property’s best features – Use the view you’ll see from under your canopy (river, stream, skyline, garden, etc.) to locate the pergola accordingly. Privacy – Adding additional lattice screens will offer seclusion. Think outside the box – Pergolas are often square or rectangle, although they can be round, octagonal or multi-leveled. Get creative. A pergola, like a deck, will need to be protected from the elements. Decide on the amount of maintenance you want to do on a yearly basis when selecting your materials. If you want to add lights or a ceiling fan, be sure to account for the added weight your structure will have to support. Electrical wiring will also need to be installed and hidden from view. Pressure treated wood – The least expensive option and can last a long time with weatherproofing. Cedar – Can be costly but its naturally beauty is hard to beat. Brick – Build the support pillars with brick and attach beams across the top for a sturdy structure. Natural stones – Creates a rustic feel, especially when including a fireplace. Wrought iron – Classic arched metal offers superior support for large plant coverings like roses or material such as canvas. Whether you are adding a pergola canopy to a concrete patio or building a stand-alone structure, make sure your foundation isn’t going to shift. Use 6×6 posts to give you solid support. Always use stainless steel nuts, bolts and brackets that won’t corrode and give way. Bury the support poles – Dig down at least 24-48 inches. Pack the dirt – Tamp it down firmly or pour concrete to stabilize the supports. Check posts to see if they are plumb. Cut pillars to same height. Place crossbeams on top – You’ll need help from those two extra hands for this stage. Cut lap joints – These interlocking notches connect posts and crossbeams. (Use stainless steel brackets if you prefer). Add optional lattice panels – Put these down the sides of the structure for privacy. Stain or paint – Protecting the wood will help it last longer. After your pergola is built, decorate with climbing plants that may look delicate at first, but they can become heavy over time. Clematis, Passion flower, Wisteria, grape vines and of course, climbing roses are all good choices. Other decorations include a canvas ribbon awning or flowing outdoor curtains, which add sun protection and a bit of color, too. A pergola can add drama to a blah patio or create a quiet retreat in your garden. It is simple to build and will give your landscape the added “wow” factor it may have been missing. Beware, pergolas are like peanuts, you can’t stop at just one. Happy building! From jigsaws and hammer drills to post hole diggers and chop saws, our expert staff is always on hand to help you find the right equipment for your next DIY building project. Want more ideas on how to spice up your patio or deck? Learn how to Boost Outdoor Entertaining Potential with New Design Elements in our recent blog. As always, if you have any questions about what to choose, pricing or how-to’s, don’t hesitate to contact us. Stop by our store — we’re open seven days a week.